Its case can be made of iron or stainless steel. Its internal joint can be made of copper or stainless steel. The Electric Contact Gauge is widely used in the supporting device and electromechanical equipments in many industries such as petroleum, chemical industry, power station, and metallurgy. 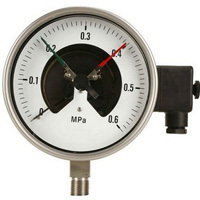 It is used to measure pressures of various non-crystallized liquid and gaseous mediums that does not clog connection port or corrode copper alloy. Besides, the mediums are without the risk of explosion. Electrical contact gauge makes the measured pressure system realize automatic control and signaling when the number reaches the preset maximum or minimum. Ma Anshan Exact Instrument Co., Ltd is a professional manufacturer of Electric Contact Gauge instruments. Our company specialize in designing and manufacturing process gauge, marine pressure gauge, oxygen pressure gauge, acetylene pressure gauge, refrigerator gauge, CNG pressure gauge and so on. Our products are widely used in oil, chemical industry, metallurgy, electricity, manufacture, papermaking, food, energy, etc. Our Electric Contact Gauges have been exported to U.S.A, Canada, Europe, Spain, Egypt and South-east Asia, mid-east and so on.